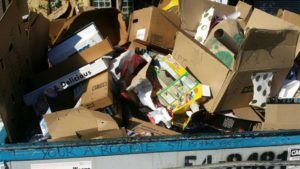 More than a dozen packaging and solid waste management companies recently called for an increase in the amount of cardboard that’s recovered through residential recycling programs. This comes at a time when localities are puling back on these programs and the leading source of residential cardboard waste – online shopping – continues its rapid growth. Believe it or not: The double digit increase in sales from on-line retailers like Amazon and subscription services like Blue Apron or Cairn has led to a decrease in the amount of cardboard American companies produce each year. That’s because more and more products are being shipped directly to American consumers in increasingly smaller or right-sized boxes than to retailers where they may arrive in “Russian Doll” shipping arrangements where several smaller boxes of a product are shipped inside of a larger box. This creates a huge problem for the solid waste industry because while the cardboard recycling rate for grocery stores, big box retailers and any other business with access to a baler comes in at 90 to 100 percent, the recycling rate for residential consumers is much less. One factor contributing to this lower residential recovery rate is the fact nearly 40 percent of Americans either don’t have access to curbside cardboard recycling services or didn’t sign up for these services if they were given the option according to a recent article in USA Today. This recycling rate could fall even more given the fact in the wake of China’s new National Sword Policy many cities like Twin Falls, Idaho, have either started sending any recyclable materials they collect straight to the landfill or abandoned their curbside recycling programs entirely. These trends combined with the fact producing cardboard boxes from recycled materials is cheaper, more energy efficient and less harmful to the environment than producing them with the raw pulp from trees likely led the Fibre Box Association and its partners to issue their statement in mid-June. Speaking on behalf of AICC – The Independent Packaging Association, American Forest & Paper Association, AMERIPEN, the Institute for Scrap Recycling Industries, Waste Management, and eight cardboard or paper manufacturers, the Fibre Box Association announced it was exploring how shifts in purchasing patterns affected cardboard recovery rates. Finally, the statement claims the Fibre Box Association recognized the need for a “renewed focus on promoting the recyclability of old cardboard containers” and listed a series of recommendations solid waste management and recycling companies could take to reach this goal. Encouraging replication of successful multi-family and rural recycling programs. According to the statement, these recommendations were based on a survey of more than 1,000 Americans who were asked about their cardboard recycling habits. It’s hard to say when any of these recommendations will be put into action or whether they’ll be followed at all. One thing we do know, given the decentralized, local approach to recycling policy-making, approaches will differ considerably across the U.S.